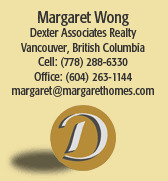 Margaret is an award-winning realtor with 17 years of experience in the Vancouver Market. Achieving her undergraduate degree of Commerce & Economics from University of British Columbia, Margaret then became a professional real estate consultant after graduating with an honoured degree. Margaret is fluent in English, Mandarin and Cantonese, and has been professionally trained by world-class master business and real estate trainers through the years. One of the keys to Margaret's success is her intuitive insights and her personal connections with her clients as well as colleagues; she loves working with people and families in getting to know their stories, helping them grow and achieving their Real Estate goals. Aside from Real Estate, Margaret is an accomplished pianist with a performance degree from The Royal Conservatory of Music and she loves photography in capturing the beautiful moments in life.